Every new college graduate dreams of scoring one of these top tech jobs working for one of the best companies in the industry. But getting your foot in the door at companies like Uber, Google and Facebook is highly competitive, especially for entry-level roles available to recent tech grads. When you consider that Google’s average salary is just a hair over $200,000, it’s no surprise why. In the past, we’ve shared interview tips for college grads and top universities with the highest graduating salaries, but today’s post is all about the five things tech grads should know before taking the leap into the job market. Whether the idea of moving to a new city sounds exciting to you or gives you the nervous sweats, having the flexibility to relocate undoubtedly opens more doors than staying in one place. According to a recent study, 44% of workers surveyed said they were willing to relocate for the right opportunity. 32% of employers said they were open to relocating new hires. It shows the company you’re flexible and genuinely interested in what they’re working on. We all know college grads can’t be too picky and should be grateful for any opportunity – even if it requires a relocation to Omaha. But that doesn’t mean most companies won’t recognize the flexibility and dedication to your career that relocating demonstrates. 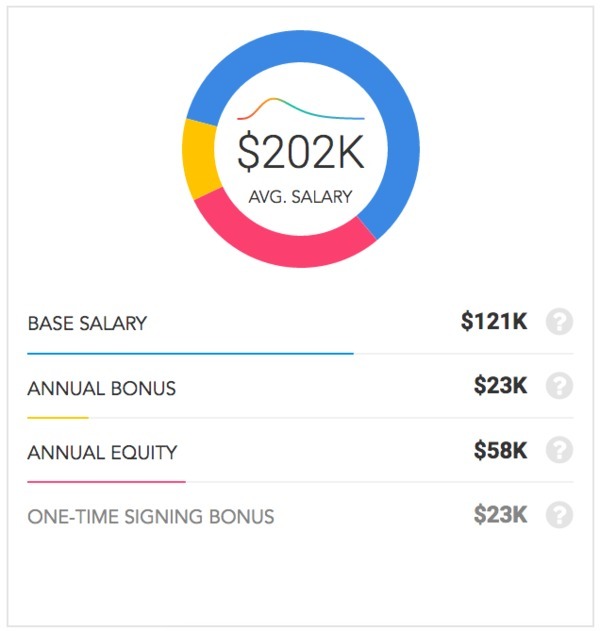 By relocating, you score points with the company early – a good thing if you plan to build a long-term career there. 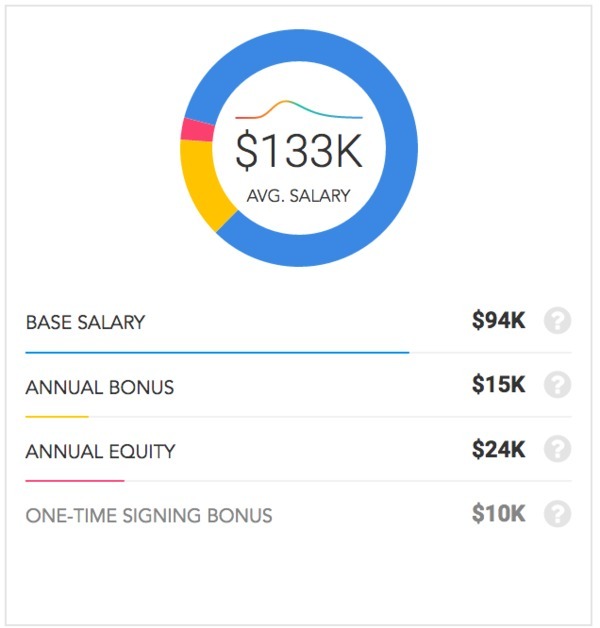 Depending on the location, it can put you on a higher salary track. Positioning yourself to start your career in a market with a higher cost of living – such as San Francisco or New York – means that you could make significantly more than if you hadn’t relocated. 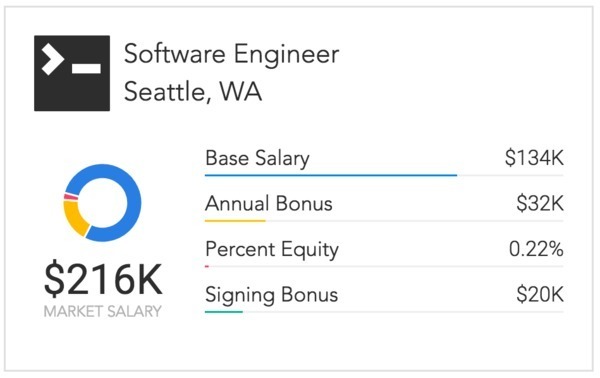 In a recent post on the Paysa blog, we detailed the salary differences for different tech jobs in San Francisco (home to Facebook, Uber, Apple and Google) versus Seattle (home to Microsoft, Amazon and Starbucks) and found that in every job category, Seattle-based employees made more than their San Francisco counterparts. Even better: the cost of living is 21% lower. Just because you want to work for a top-ranked tech company doesn’t mean you need to live in San Francisco, Seattle, or New York. Tech jobs are popping up all over the country for some big-name companies. In Pittsburgh, Uber is currently on the hunt for an Integrations System Engineer to work on their fleet of autonomous cars. The market salary for this position is $271K annually. Tempe, Arizona (home to Arizona State University) currently has several openings with Cognizant, including an entry-level Social Media Analyst role. Expected market salary for this position? $124K annually. Finally, MedSynergies needs an entry-level Network Engineer based in Denver, CO. 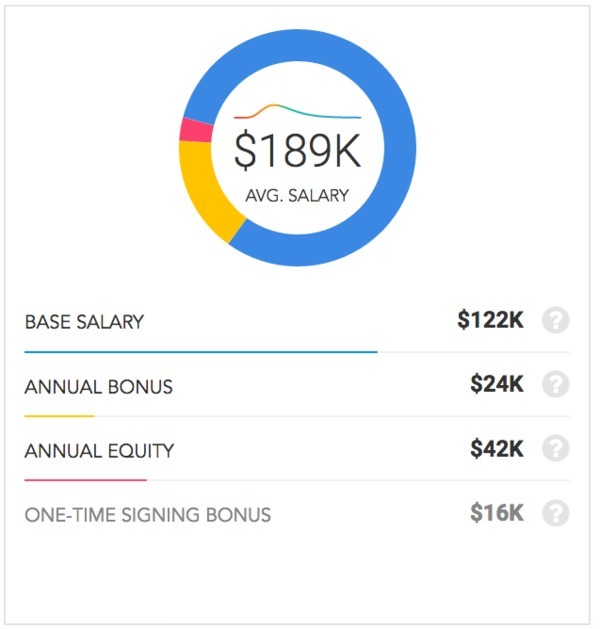 The successful candidate can expect a market salary of $131K annually. Be open to the idea of relocation: the impact on your career and the challenge to you personally can bring out the best in you. There was a time where salary ambiguity was an inevitable evil of every college grad’s job search. With no professional experience and therefore nothing to measure against, it was impossible to know whether or not the salary offered was competitive and fair. Fortunately, those days are completely over. Paysa not only provides insight into role-specific salaries at top tech companies, there’s also this salary calculator that breaks down how much you should be making in base salary, bonus, and equity by location and/or company. 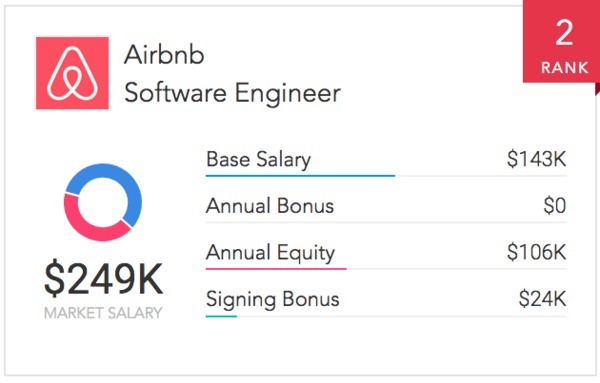 So now, when Airbnb makes you an offer to join the team as a software engineer, you can evaluate the offer through Paysa to find out that the average salary for software engineers there is a whopping $249,000. And if the offer comes in low, Paysa can help you negotiate a better offer as well. More often than not, people choose their university based on cost, location and simply whether or not they got accepted, but that doesn’t stop companies from making biased judgments based on the school you attended. The quality of your university’s computer science program, rigor of the curriculum, and opportunities for internships all play a big role in whether or not you’re qualified for tech jobs from top companies. Over the last few weeks, the Paysa blog has featured several posts comparing top-ranked computer science schools like Columbia, Cornell, Harvard, MIT, Stanford and UC Berkeley. 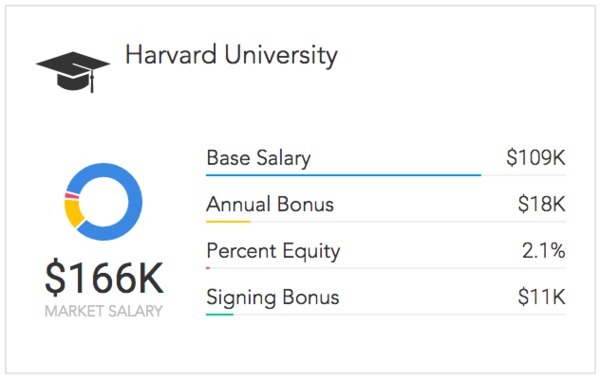 Harvard graduates had the highest average salary across all six universities with $166,000 average for the first two years of work experience. The good news here is that if you didn’t attend an Ivy League school, there are definitely ways to overcome hesitation from a potential employer. While your interviewer may have a positive bias toward Stanford grads for entry-level developer roles, if your resume shows that you’ve contributed to open source projects, you’re demonstrating real-world, out-of-the-classroom experience. Ultimately, that practical experience carries far more weight than someone with no coding experience outside the Stanford Computer Lab. Once you start applying to open tech jobs, interviews will undoubtedly become your primary focus. We’ve covered top interview tips for computer science graduates in the past, but simply put: you need to be extra prepared for every interview that comes your way. Even if you don’t plan to accept the position. Especially as a recent college graduate. Sure, you might be prepared for the softball questions every interviewer tosses out (“What are your biggest weaknesses?”, etc. ), but no two interviews are the same and practicing answering questions on your background, experience, and goals will come in handy when sitting down to interview for the job you actually want. Interviews give you negotiating power. Hype creates more hype. It’s the same reason lines are out the door for the 25 seat restaurant while the 200-seat spot around the corner sits half-empty: people are naturally drawn to what others are interested in. The philosophy applies to you as a candidate as well. If you have several interviews across town and subtly let your recruiter know, that can create even more interest amongst companies, giving you some negotiating power once offers start coming your way. You might think you have no interest in working for a small startup focused on data governance, but you don’t know what you don’t know. An interview gives you the opportunity to uncover more information about a company, their goals and how you might fit into the team. You could be surprised with how interesting an opportunity you previously dismissed sounds after actually speaking with someone at the company. Whether in an interview or after starting your first job out of college, be overly inquisitive for at least the first year. Employers don’t expect you to know everything straight out of school. What they do expect is that you’ll be eager to learn. You might think asking questions makes you look incompetent or unqualified for your job, but as Karen Ballum points out, asking questions actually demonstrates you’re doing your job to the best of your ability. Don’t be afraid to be the new hire asking all the questions. Chances are, all the other new hires (and maybe even a few veterans) have been wondering the same thing. These five things every tech grad should know before starting their hunt for tech jobs are really just the beginning. Paysa is here to help. Designed to help recent graduates and experienced tech workers find, evaluate and negotiate opportunities with top tech companies, Paysa should be your go-to resource for post-graduate career advice and job searching. Paysa users make up to $39,000 more per year in top tech jobs, so check us out today for in-depth salary information, open jobs with top companies and more.